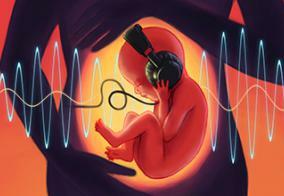 What does a baby hear in the womb? Monkey Music's founder, Angie Coates is a mum to 5 girls. Here she explains how your baby can learn to recognise the sounds it hears in the womb. The ear is the first organ to be fully developed in the womb but what does your baby hear? While I was pregnant I was teaching music and singing all day long. My unborn baby would often kick and move around and I liked to think she was showing me which music she liked best. The bigger the kick…the more she was enjoying it! I have since learnt that her reactions were probably more to do with how ‘new’ the sounds were that she was hearing. Depending on how well she understood the sound would have had an effect on how much she responded. Research has confirmed that babies respond noticeably to sound from about 5 months. Not only are they aware of the noises inside the womb, like your blood gushing and heart pumping, they can also hear noises from outside of the womb and they ‘learn’ to recognise them. To ‘learn’ the unborn baby must be use their memory. How can that be? Dr Peiper was one of the first scientists who believed that unborn babies had the capability to form memories. In his experiments, he observed that unborn babies reacted intensely when they first hear a car horn, but that after they heard it several times, they reacted less and eventually stopped moving around. He proposed that the sound of the car horn left a ‘trace’ that was an early form of memory. This ‘memory trace’ is now called habituation (getting used to things), which is considered one of the simplest, yet essential learning processes. So, back to my pregnant teaching days. When I was using the same sounds (i.e. favourite nursery rhymes, sound of drum, clapping etc) these will have quickly become familiar to my baby and will have left a ‘memory trace’. My baby won’t necessarily have responded to hearing those sounds. On other days, when I was playing new instruments and listening to new repertoire my baby will have been hearing ‘new’ sounds and will have been encouraged to respond with great vigour! There is still a lot to learn about the processes involved in memory and learning in the uterus but, early exposure to different sounds and music seem to go a long way to forming another foundation for a head start at birth. * Habituation – is the ability to react less strongly to a repeated non-threatening stimulus.